Cocoia Blog » Going creative with your Dock. 29 Oct Going creative with your Dock. Since the release of Leopard, a huge movement has already sprung up to change its look. Check out this colorful glass surface (ugh, is that a truck crashing?). Apparently, people are flocking to the new Dock as a means to customize OS X even more. I see a market for an app that does this, guys. The only thing I still can’t change is Finders Dock Icon. Do you also know a way how to change this? Tiggar, you might want to check out Panic’s Candybar for such ‘stubborn’ icons; this app makes it easier to apply (system) icons. There’s a free trial available over at panic.com. I’m disappointed that all of us with docks on the side are left out of this modding fun. No matter what I try, the left-side dock stays stubbornly flat and smoked. 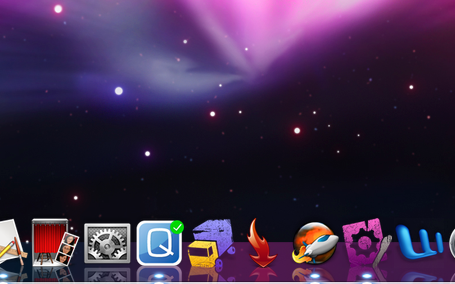 Also, what is that Q icon in your dock? @Raven; fortunately, this isn’t my Dock; I am very happy with my flat smoky look. I’ll inform around if there’s a possibility to have the glassy dock on the side.